Building on a long heritage of celebrated Shakespeare adaptations in India, Microwave International: Shakespeare India is an exciting and inventive initiative. 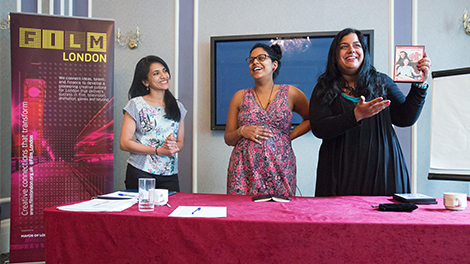 In its first stages, 16 Asian filmmakers from the UK and India were put into six teams to work on feature film ideas drawing from the work of Shakespeare, with one film eventually greenlit and awarded funding. The project's £500k budget covers everything from the film's production through to support and development for the filmmakers. The Hungry was the feature film project eventually selected to be greenlit, with plans for a theatrical release as part of Film London's Shakespeare on Screen activities for the Shakespeare400 celebrations. It is currently in development. The teams were given time to further develop their ideas before making a final pitch to a panel of industry experts. Find out what our Microwave filmmakers had to say about Shakespeare's enduring impact on Indian cinema. Microwave International: Shakespeare India is funded by Cinestaan Film Company in India and an EIS from Bob & Co in the UK. Nyman Libson Paul/Goldfinch Entertainment are accountants and finance consultants. Additional funding for training, mentoring and development is supported by the British Council.